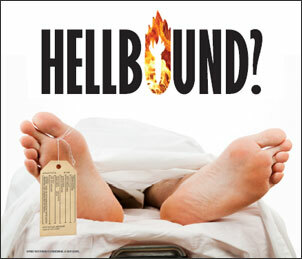 When I first heard about Hellbound?, Kevin Miller's new documentary that critically examines the doctrine of hell, I was encouraged. With the recent plethora of books and commentary on the topic that challenge the traditional position (including two chapters in my book, Confessions of a Bible Thumper), how captivating would it be to put this doctrine under fire on film? Sounded promising. Well, now that I've seen the film (twice), sure enough, my hope for a visual fair hearing of a "biblical" (warning, loaded term) view of universal reconciliation was realized. The movie was sheer genious. Miller and co-producers David Rempel and Brad Jersak just didn't lay out a case for rethinking hell but forced viewers to face the conventional dogma of eternal damnation head on. We heard straight from the mouths of conservative pastors and evangelists (from the whole spectrum--right-wing wackos from the infamous Phelps church to hip but hyper-conservative Mark Driscoll to moderate-sounding theologian Kevin DeYoung), without interuption, where the notion of hell leads. They let the doctrine speak for itself, in other words. That's when the emotional disconnect between everlasting punishment for one half to 99.99 percent of the human race (depending on who was defending it) and an unconditionally loving God hit viewers like a ton of bricks, kiln-fired to 2000-degrees Farenheit. Huh?, was the unspoken response, just as Rob Bell had asked. But Miller and company don't leave you there. Just when you were thinking, there must be a better way, through theologians, scholars, and studied authors,* they piled on the preponderance of evidence that hell is a modern misinterpretation of religious narratives anchored in an ancient history we know little about. Gehenna, erroneously translated as "hell" in the New Testament, is a metaphor for judgment in this life, God's justice is restorative, not retributive, the term "everlasting" is mistranslated, and much of the early church embraced the idea of universal reconciliation. The overall impression the film leaves is inspiring and redemptive. Cries of heresy by convervatives are misplaced as should be a sense of superiority by Universalists. So much of this stuff is a mystery. The question boils down to, what kind of God do we think we serve? Run, don't walk, to see this film. It's an important commentary on our religious divide. It fairly lays out a continuum of positions. It opens up a vision for the nonviolent paradigm Jesus espoused. The honest listening and questioning is refreshing. The music is powerful. Five out of five stars. Easy. After you view it, come back here and join the conversation through your comments. Or, better yet, grab a brew of your preference and have a discussion with friends. *My only critique of the film is minor. They definitely interviewed top voices who expose the problems with the traditional view, such as Robin Parry (pseudonym is Gregory MacDonald) and many others, but they left out one important author, Thomas Talbott, who in many ways began this conversation about rethinking hell in 1999 with his watershed book, The Inescapable Love of God.